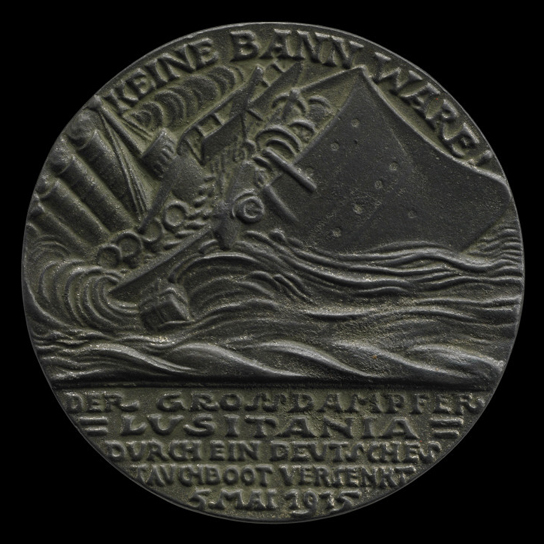 As a reaction to the sinking of RMS Lusitania by torpedo on 7 May 1915, German artist Karl Goetz produced the Lusitania medal satirising the subject. Henry Flynn explains the symbolism behind the medal which will be on display in The other side of the medal: how Germany saw the First World War. The Money and Medals Network is an Arts Council England-funded project that exists to build and develop relationships between UK museums that have numismatic collections. As the project curator, I travel to these museums to meet the members of staff who care for such collections. One object that I have seen time and again in museums all over the country is the Lusitania medal by Karl Goetz. RMS Lusitania coming into port, possibly in New York, 1907-13, Library of Congress, Prints and Photographs Division, Detroit Publishing Company Collection. The sinking of RMS Lusitania on 7 May 1915 was a hugely significant event during the First World War. The ship was sunk by a torpedo, a fact indicative of the increased use of submarines in marine warfare, which helped it become even more dangerous than it had been previously. The tragedy of the loss of life that included civilian passengers had global repercussions that contributed to the eventual decision taken by the United States to enter the conflict. It also sparked something of a medallic propaganda war. The German artist Karl Goetz was so incensed by the mere idea that a passenger liner might have been used for military purposes that he decided to produce a medal satirising the subject. He mistakenly stated on the medal that the date of the sinking was 5 May – two days earlier than the actual event. This caused an outcry in Britain and accusations that the sinking had been premeditated by the Germans. This use of the wrong date was in fact a mistake, but copies of the medal were made and distributed in Britain in protest against the Germans’ use of medallic art to effectively celebrate a tragedy. The British copy had its own presentation box that also included a document detailing the reasons behind its production. Many of these medals have since found their way into the collections of museums across the country and will be featuring in commemorative displays this year and in 2015. The British Museum has an example of the German original and the British copy and both will be displayed in the new exhibition The other side of the medal: how Germany saw the First World War. Alongside my work on the Money and Medals Network, I have had some curatorial input into this exhibition curated by my colleague Tom Hockenhull. The medal itself is a fascinating object that is laced with satirical symbolism. On the obverse, the ship is depicted sinking under the waves. Weapons appear on the deck, a direct accusation that the ship had been carrying munitions, thus putting the lives of its passengers at risk, the notion that had so infuriated Goetz. The reverse shows unsuspecting passengers queuing up to buy their tickets from a personification of Death who sits inside the ticket booth. The warnings of a German man stood in the background and the ‘U-Boat Danger’ headline on a newspaper go unnoticed by the crowd. The inscription above the scene means ‘business above all’ and makes the message of the medal doubly clear. The presence of Death playing an active and malevolent role in the events is a theme that pervaded German medallic art during the First World War and this will be explored in the exhibition. Propeller from RMS Lusitania, National Museums Liverpool. (Photo: (c) Henry Flynn). In 1982 one of the four propellers from the vessel was salvaged from the wreck and subsequently acquired by National Museums Liverpool. The Lusitania has a strong link with Liverpool and the propeller, now part of the collection of the Merseyside Maritime Museum, is displayed on the quayside at the Albert Dock. Services of remembrance are held next to it every year on the anniversary of the sinking of the ship.